Erika, I'm so glad you made these and liked them! I imagine that they were divine with the quince jam. Isn't it funny how we both woke up with an inexplicable urge to make them? I adore soft cookies...I typically do a shortbread type of cookie for the base of my thumbprints, but I love this cream cheese idea! I want to try these now! Thanks for sharing another great post with me. I hope you are having a week of family, friends and love! 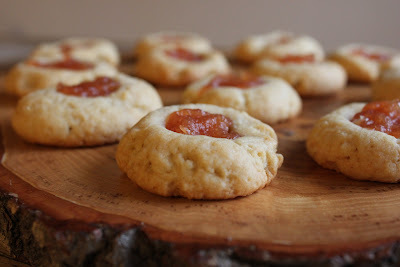 I love thumbprint cookies, they're so much fun to make and always so pretty! 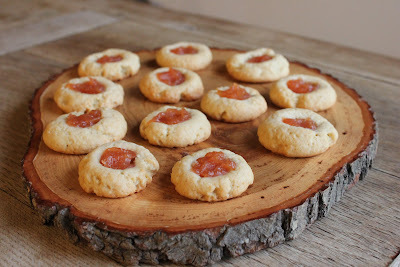 I so enjoy thumbprint cookies this time of year... and with the copious amounts of jam I have in my cabinet, I think I need to make some of these cookies! My friend at work was just talking about jam thumbprint cookies (pbj cookies) and then I stumble on these cookies. It's a sign. I am so glad that you did not resist the urge - these are definitely my kind of cookie!! First, though, I am going to have to make some of that quince jam!! Just came across these. I adore sweet potato biscuits and can't wait to give these ones a try. Thank you!